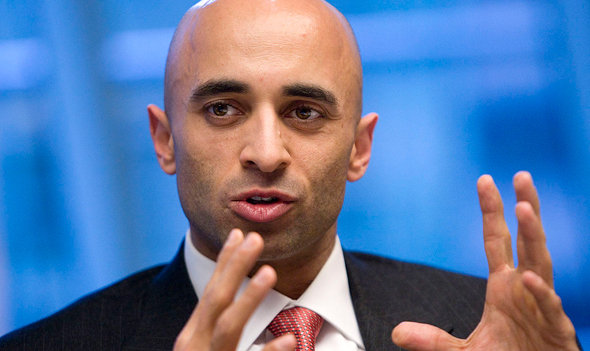 – The UAE Ambassador to the US, Youssef Al Otaiba, penned an op-ed for the Wall Street Journal. In the op-ed he details organisations and transactions that link Qatar to the funding of terrorism: “For years, Qatar has supported and sheltered extremists. In the mid-1990s, it harboured the notorious terrorist Khalid Sheikh Mohammed, who became one of the principal plotters of the Sept. 11 attacks. Today it hosts and promotes the Muslim Brotherhood’s spiritual leader Yusuf al-Qaradawi, as well as Khaled Mashal, leader of Hamas, a U.S.-designated terrorist organisation. “The limitation on the use of Saudi airspace is only limited to Qatar Airways or Qatari-owned aircraft, not anybody else,” explained Saudi authorities of the ruling (and the same applies in the UAE). – The UAE Civil Aviation Authority released a statement to affirm that it stands by its decision to ban Qatari aviation companies and aircraft from transiting through its airspace or landing in its airports. They said that the boycott “does not include the aviation companies and aircraft not registered in the UAE or Qatar, and wishing to cross the country’s airspace to and from Qatar”. But they did say that non-Qatari private and chartered flights must submit a request to the General Civil Aviation Authority at least 24 hours before flight to charter UAE airspace. This must include a list of names and nationalities of crew and passengers, and the cargo carried by the aircraft. – Morocco said on Sunday that it would remain neutral and offered to facilitate dialogue. – FIFA president Gianni Infantino has said that he doesn’t think this situation will affect 2022’s World Cup in Qatar: “I am confident that the region will return to a normalised situation”. – Iranian officials have said that they have been sending four cargo planes of fresh fruit and vegetables to Qatar every day. – The UAE’s President has instructed authorities to take into consideration the humanitarian circumstances of Emirati-Qatari families. A hotline has been set up by the Ministry of Interior to help Emirati-Qatari joint families. Call (800) 2626 for help if your family is in this category. Bahrain and Saudi have set up similar hotlines (+97317399821 for Bahrain and +966112409111 for Saudi Arabia). – Qatar’s Ministry of Interior has released a statement to say that nationals of countries that have cut diplomatic ties with Qatar are still free to remain in the Gulf state. This will come as a relief to the Egyptians in Qatar, who make up one of the largest expat groups in the country (Egypt has cut diplomatic ties with Qatar). – The Qatar Airways website has been blocked in the UAE. Customers of the airline in the UAE will now have to rely on the call centres to make changes or get refunds. – Emirates Post Group has suspended all postal service to Qatar from its offices in the UAE. All items yet to be delivered will be returned to sender (with postal fees refunded). – Foreigners living in Qatar with residence visas will no longer be eligible for visas on arrival into the United Arab Emirates. – All Qatar Airways offices in the UAE are now closed – a decision made by the UAE General Civil Aviation Authority. This means people in the UAE with flights booked with Qatar Airways will have to rely on the airline’s call centres. 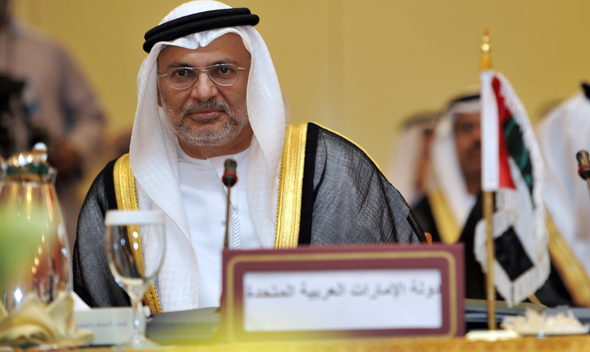 – The UAE Minister of Foreign Affairs Anwar Gargash released a statement, saying: “As Qatar is a neighbour, it should commit to the rules of security and the stability of the Gulf. It has to stop playing the role of the main promoter of extremism and terrorism in the region…. The crisis has increased, and we have reached a dead end in our endeavours to convince Qatar to change its course.” He stressed that members of the Muslim Brotherhood should not have a safe haven in the region. – The Indian embassy in Qatar has tweeted that there is “nothing happening that suggests any threat to physical security. There is no shortage of food items in the markets in Qatar. Please do not panic. Food retailers are ensuring uninterrupted supplies,” it added. 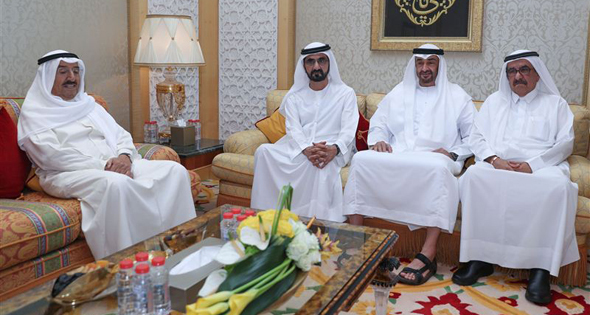 – Both HH Sheikh Mohammed bin Rashid Al Maktoum, Vice President and Prime Minister of the UAE, and HH Sheikh Mohamed bin Zayed Al Nahyan, Crown Prince of Abu Dhabi, met with Kuwait’s Emir at Zabeel Palace on Wednesday. The Kuwaiti Emir jetted to Qatar after meeting the UAE rulers. – Qatar Airways group CEO Akbar Al Baker has said that Qatar Airways ensured that “all passengers were brought home safely to Doha within 24 hours of the flight cancellations”. – The UAE general prosecutor Hamad Saif Al-Shamsi has warned that showing sympathy for Qatar on social media is a cybercrime, punishable by UAE law. Al Arabiya News reported that UAE-based social media users posting pro-Qatar content could be fined Dhs500,000 and see between three and 15 years in prison. – Jordan has now joined in, downgrading its number of diplomats in Qatar and withdrawing Al Jazeera’s license from the country. Mauritania and the Comoros have cut ties and Gabon has expressed condemnation against Qatar, while Djibouti has downgraded diplomatic relations with the country. – Etihad Airways has announced that all travellers holding Qatari passports are now prohibited from even transiting through the United Arab Emirates. – The Qatar-based beIN Sports network has been blocked in the UAE on both Du and Etisalat leaving paying customers without football. Read more about that here. – Kuwait’s Emir was in Saudi Arabia Tuesday to meet King Salman – he is believed to be acting as a mediator. “We are willing to sit and talk,” Qatar’s Foreign Minister Sheikh Mohammed bin Abdulrahman al-Thani al-Thani told CNN Tuesday. – After telling customers it was business as usual for most of Monday, Qatar Airways announced at 7pm Monday it will cease all flights to and from the UAE as of 4am UAE time on Tuesday June 6. The UAE’s official news agency announced a “closure of UAE airspace and seaports for all Qataris in 24 hours and a banning of all Qatari means of transportation, coming to or leaving the UAE, from crossing, entering or leaving the UAE territories” on Monday morning. – “All customers booked on affected flights will be provided with alternative options, including the option of a full refund on any unused tickets and free rebooking to the nearest alternative Qatar Airways network destination,” the airline has said. Qatar Airways call centres told customers on Monday that they will aim to offer a transfer of tickets to partner airlines when possible. Partner airlines include airberlin, American Airlines, British Airways, Cathay Pacific, Finnair, Iberia, Japan Airlines, LAN, Malaysia Airlines, Qantas, Royal Jordanian, S7 Airlines, SriLankan Airlines, TAM Airlines and around 30 affiliates. Qatar has also cancelled flights to and from Egypt, Saudi and Bahrain. Read more from the airline here. The Qatar Airways call centres in the UAE were virtually impossible to get through to on Tuesday. – US President Donald Trump had this to say on the matter on Tuesday afternoon UAE time: On Thursday he said he is willing to mediate the crisis (and welcomed the leaders to the White House). – Qatar Airways organised three charter flights on Tuesday for its customers from Jeddah to Muscat via Oman Air. The passengers then went on to Doha with Qatar Airways. – Flydubai stopped all flights to and from Doha as of Tuesday June 6. – AirArabia has followed suit and cancelled all flights from Sharjah to Doha, effective Tuesday June 6. – The link between Doha and Dubai affects many flights, with many in the UAE flying with Qatar Airways to destinations as far afield as London, Auckland and Kuala Lumpur. The closure of UAE and Saudi airspace would mean all Qatar Airways flights will have to take a north route via Iran, no matter their final destination (adding flight time to many routes). The Eid holidays are coming up, and that’s a particularly busy travel period in the region. – The UAE gave Qatari diplomats 48 hours as of Monday morning to leave the UAE – and they’ve broken off all diplomatic relations with the country – which is particularly notable considering it’s part of the GCC. – The UAE’s official news agency also says it’s “preventing Qatari nationals from entering the UAE or crossing its points of entry” and is “giving Qatari residents and visitors in the UAE 14 days to leave the country for precautionary security reasons. The UAE nationals are likewise banned from traveling to or staying in Qatar or transiting through its territories.” Note: This doesn’t currently affect UAE residents, just Emirati citizens. With all flights to and from the UAE and Qatar suspended, Qataris who leave within the 14 days will have to fly to a different location and then home to Qatar. 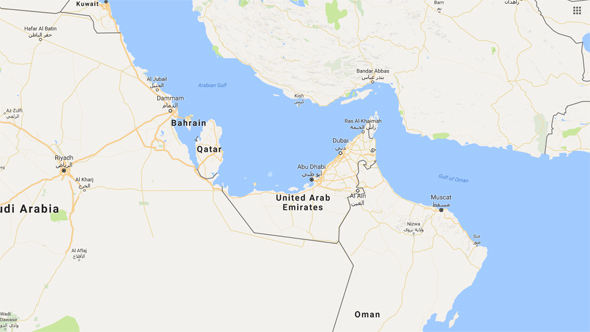 – Saudi Arabia, Egypt, the Maldives and Bahrain have also cut diplomatic relations with Qatar, as have the Yemeni and temporary Libyan government, and Saudi has closed its land border with Qatar (there’s still no clarity on how quickly that closure will happen). According to the BBC about 40% of Qatar’s food comes in via this land border. The border with Saudi is Qatar’s only land border – and so the nation will become an island in trade terms. This will likely cause inflation in the country. – Saudi Arabia has revoked the licence of Qatar Airways and the Saudi General Authority for Civil Aviation has said it will shut down the airline’s offices in the Kingdom. – Note: This information was correct as of 9.30am UAE time Wednesday, but it’s a fluid situation.